I think the most valuable part of this course are the lessons on how to build better relationships with student/athletes and their parents! Getting past just teaching the fundamentals and physical skills of a sport is the start of the coach/athlete relationship and will assist any coach in develop their entire program. I would recommend this course because I feel that it is important for coaches to remember why students get involved in sports to begin with and it is also important for coaches to be more conscientious about building relationships with their athletes and their families to build a cohesion among all the parties involved in their program. I absolutely recommend this course. It makes you take a step back and evaluate yourself as a coach and how you go about your daily interactions with the student-athletes you coach. I would definitely recommend this to other coaches. The values taught here are applicable for players and are reminders to coaches about their own approach to life. The reinforcement for the philosophy of coaching for skills AND character and heart, and techniques for accomplishing this was the most valuable part. This course is a sound guideline for coaches to follow if they want to have an impact on their players beyond wins & losses. It reinforced my methods of coaching and provided me with new ideas to try. This is not just for coaching, but for parenting, teaching, leadership, etc...the principles of this course transfer to every area of my life. This course will transform every program that has a coach that will allow themselves to lead from the 2nd and 3rd Dimension. I think to many coaches put much emphasis on the wrong things. I know this course changed my views on things! I would recommend it to other coaches. I have already started implementing the put ups and spotlight drills in my summer workouts! I can't wait to implement more of the skills throughout the year! I would definitely recommend this course, especially to experienced coaches who have their minds set on doing it the same way they always have. Coaching from the heart is more important than wins and losses. I found it truly gave value to 'how' I already feel a coach should coach. I would recommend this course for a requirement course for all new coaches. This course provides the understanding that coaching is more than 'wins'. I found out that I was a 2nd Dimension coach....and got strategies to move to the 3rd. I think young coaches need things like this to help them find their purpose and experienced coaches to adjust their compass. I recommend it. Learning the particular strategies in both the 2nd and 3rd dimensions was the most valuable part of this course. I know without hesitation that I will make every effort to get the information on this course to every coach that I am able to be in front of. This course reaffirms what I believe to be true. Relationships are more important than the Jimmy's and the Joe's. Loved the whole program. Definitely would recommend to all coaches because it identifies what many student athletes are yearning for.......a coach that cares about them as a person first! We feel so strongly about this course, we have made it a professional development piece for all of our coaches to complete! This course changed my coaching outlook and helped me redefine my purpose. I would recommend it to other coaches. One of the best things is to discover that I have been coaching in the 2nd and 3rd dimensions without really knowing. This helps me to be confident to push myself to do more of it and has given me some specific strategies to use. The self reflection it required me to do as a coach and as a person was the most valuable thing I got out of taking this course. I believe every coach young and experienced should take this course to challenge themselves to grow as a coach and as a person. The 3D Coaching content gave my coaches the opportunity to come together as a small group and learn about the importance of the three different dimensions of coaching. The information was presented in a manner that my coaches could relate to. The philosophy and curriculum of this program is both top notch & research based, but more importantly it is what is best for our kids. This course gives perspective to Coaching, meaning beyond a winning record by mastering Level 1, but the broader, long-term impact of 2 and 3, which does not in any way take away from Level 1. As statistics point out, most are good at Level 1, likely now aware of the paradigms defined by Level 2 and 3. I give this course a 10/10. The strategies and philosophy were the most valuable takeaway and I would absolutely recommend this course to other coaches. The importance of coaching in the 2nd and 3rd dimension and the lasting impact it will have on our coaches, athletes and families was very valuable to think about. I definitely would recommend this course to other coaches because of it's ability to have a transformational impact on their programs. The most valuable thing i got out of taking this course is that I can and will become a three dimensional coach in all areas of my life. I would recommend this course to other coaches as it challenges and stretches you in every area of your coaching at the same time empowering you and filling you with hope, joy and courage to continue to make an impact in the lives of those around you on and off the playing field. The most valuable takeaway for me is the validation of my thinking that the focus on competition and number of games for our youth athletes has become too great and that a renewed focus on molding individuals will lead to better men and women in the future and better on-field performance from those we coach. I would absolutely recommend this course to other coaches as I believe it serves as either a reminder of why we coach - to impact our players for now and for their future in a positive way. The best way to do so is indeed from the inside out. The affirmation of my approach to coaching. The Athletic Experience is not about winning, it is about the journey and the relationships you make on that journey. YES, I would recommend this to other coaches. Coaches spend time and money learning the 1st dimension of their sport, the Xs and Os. This course takes a coach beyond their sport and encourages them to coach the value of sport. It was valuable to learn how important it is to go beyond winning games and more to character and leadership development which lasts a lifetime. I would absolutely recommend this course! It takes coaching to a whole another level. The most valuable thing to me was understanding the relationship between Great to Good and how coaches play such a crucial role in directing the byproduct, so as not to become jealous, selfish, greedy or revengeful. I would absolutely recommend this course because statistically most coaches are only coaching in the first dimension and I have personally been negatively affected by this kind of coaching. I gained a full-picture appreciation for all that 3D Coaching can be, and where it can lead. I would absolutely recommend this course to other coaches and will hopefully have a chance to make offerings more regular/accessible.. Developing my transformational purpose statement and beginning to outline my strategy to achieve that purpose was the most valuable part of this course. I'd recommend it to coaches because it lays out the basis for true coaching and gives some handles to get on that journey. 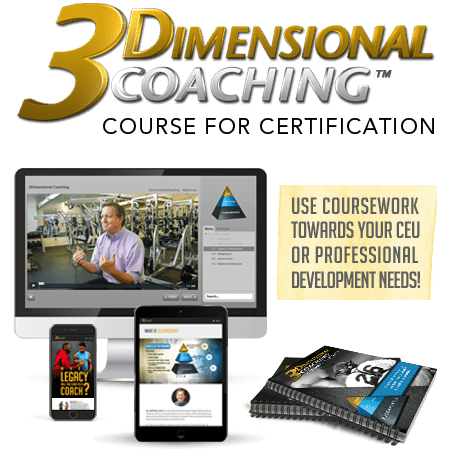 To gain a full understanding the 3 dimensions of coaching and how to implement a plan for the second and third dimensions was extremely valuable. I would absolutely recommend this course. Reaching the heart of an athlete and presenting that individual with skills that will be of value in life is critical. Furthermore, this type of coaching helps the individual reach his full potential as a person. Breaking down the 2nd and 3rd Dimensions to coaching and the realistic ways to connect with athletes was the most valuable part of this course. This is great material and very needed in our broken culture. This course gave very detailed content on 2nd and 3rd dimension. Not only told you what you needed to do but gave suggestions on how. I've already recommended this to other coaches. The content in this course is very good. I would absolutely recommend it to other coaches. From experience and observation, most coaches function only in the 1st dimension. I'm passionate about the missed opportunities in the second and third dimensions. This course explains why we all get into coaching but not what usually happens. It helps that you are given different ways of trying to instill life lessons in a practice. Learning the ways to coach the 2nd and 3rd dimensions (spotlight drill, put ups, letters home etc.) was very valuable. One should not just coach the athlete to the sport, but coach the athlete in life. This course will help others reach their potential as a coach, a coach of life. I recommend it. This course puts it into perspective what our role as coaches/teachers really is. It was valuable to look at real life instances of this 3D model at work. I would recommend this course because it questions what you are doing as the correct way and whether it is best for kids. This course provides specific strategies to implement the Level 2 & 3 ideas. I recommend this course to other coaches because it would help them refocus their goals and strategies when working with athletes in any sport. All coaches should watch these courses. These courses are essential for all of coaches at any level. It was valuable to learn how to motivate athletes and to distinguish the difference between goals and purpose. The most valuable part of this course was that it helped me re-evaluate the programs that I am involved in. I would recommend it to other coaches, great reflection. This course shows how to build relationships with kids and what is important about coaching. It reminds us that helping kids become better people is more important than wins and loses. I would recommend it because it reinforces why we coach. The most valuable thing was the importance of moving beyond the sport specific x's and o's and forming trust with the players. I will recommend this course to other coaches. This course gave great ideas to help improve my coaching ability and the lives of our students and athletes. I would recommend this course because this course would benefit all coaches at any age level or sport! This course got me to think about how my players view me as a coach and how I want to be viewed. Every coach should absolutely take this course if they truly want to make a positive, lasting impact on the lives of young people. This course has great information to help coaches become better and to understand their athletes better. It was valuable to be reminded that the athletes need to love and enjoy the sport to be motivated. This course was insightful and talked about a variety of topics. It gave me new insights on coaching and how to coach beyond the first dimension. We need to get out of the concept of win at all costs and look at what truly defines win. I would recommend this course to other coaches. It helps us consider the impact of reaching the heart of a student. This course gave me strategies for how to build a bond with an athlete that is better than 'my door is always open.' I think this is one of the best courses and am going to recommend it to my other coaches. Things have changed in HS coaching.......development of relationship is so key to success in HS. This course provides opportunity to learn how to develop and foster relationships. I would recommend it to other coaches! This course gave me a greater understanding and strategies to help build relationships with my students, athletes and others. It is a great way to evaluate where you are currently and clearly define what you want to accomplish. This course helped me realize I need to work on focusing on things besides wrestling. There are a lot of ideas/strategies that are beneficial. I would recommend this course for coaches. There is a lot of valuable information throughout this course. I really value coaching in the 3 different dimensions because I have seen the difference between my past coaches. I have learned a lot from this course. I would recommend this course for coaches AND teachers. Making a connection with students is very important. The examples of specific strategies to use you give are so valuable. The teaching towards the 2nd and 3rd dimensions information was the most valuable. I already have recommended this course to my coaches and they are registering to take it now before our season begins. I want us to all be on the same page and for them to understand my philosophy on coaching the WHOLE athlete. The most valuable thing I got out of this course was learning the impact I have as a coach, and the value of reflecting on the why of why I coach and how that can help me develop strategies in my daily coaching practices. I would recommend this course and have already started recommending this course to coaches because I think that many coaches in our society today do not realize the platform that they have and impact they are having on young athletes lives. It is important for coaches to continue their education and this is a great resource. The motivation resources used to help athletes perform at their best was very valuable. I would recommend this cours to other coaches. It would be great for any coach to take. The most valuable part of taking this course was learning about the 2nd and 3rd Dimension. I'd give it a 10/10. All of the information was valuable, but I did find filling out the worksheet very helpful. I believe that each coach should have a better understanding of the three dimensions, so I would recommend this course to other coaches. This was valuable how it helped with learning different messages and purposes that go beyond simply winning and losing. The fact that we can impact kids lives far beyond the sports they play. I would recommend this course to other coaches because I see most coaches that only coach in the 1st dimension and see kids suffer because of it. This course reinforced what I already do and forced me to actually put it down on paper. I recommend this to other coaches. I believe every coach needs to coach this way. Writing my purpose statement as a coach was the most valuable thing I got out of taking this course. I would recommend this course to others. It really brought to light the things I want to focus on and the things I want my athletes to learn from me. I believe that I will be able to be more successful as a coach because I learned several new ways to help keep my athletes motivated. I have already recommended this to all of my assistant coaches. I believe that every coach I know can take something from this course that will help make them a better coach. I am highly recommending all coaches to take on this course. The course opens a lifetime relationship for coaches and athletes: isn't that why coaches coach? It empowers us to connect with athletes at the heart. This way this course taught the different dimensions of the coaching pyramid was the most valuable part of this course. I would recommend it to other coaches. This course showed how to be a great coach must coach in all 3 dimensions. I would recommend this to other coaches so coaches can learn how and why to coach not only in the 1st dimension but in all 3. It was valuable to learn the team building strategies, and help when discussing the importance for sports with parents. I would recommend it to other Coaches. I took a lot of ideas about how to put more into my coaching and not just make it about the fundamentals.I would recommend this course to other coaches because I think it helps get a little more understanding of coaching and what you can do to not just improve your athletes but yourself. The most valuable part of the course for me was developing a clearly defined purpose statement. I would absolutely recommend this course to other coaches! It helps coaches with strategies to develop the whole athlete. The discussion sessions were the most valuable part of this course to me. I would definitely recommend it to other coaches. It educates coaches on the impact they have on players and how to handle our influence in positive ways. The affirmation that 3D coaching approach enhances winning and is a strong way to coach rather than a weak way was very valuable. I would recommend this course to other coaches. It is very inspirational and motivating. I would recommend this course to coaches, and I would also recommend to teachers. I think in today's world we under-value the importance of developing the mind and heart of students/athletes that are under our care. Learning about the value of developing level 2 and level 3 on a team was very valuable. The mind and heart use to be developed by parents ... not the case anymore! The affirmation that caring about the athletes is more important than winning all the time was one of the most valuable parts of thisc course. Building young adults is the goal! I would recommend it to other coaches. All coaches need a reminder of WHY they are doing what they do. I would absolutely recommend this course! Most coaches want to make an impact beyond the field, court, track etc. but don't have the skills or knowledge to. This course clearly defines ways to implement systems that will impact the student/athlete of today. The strategies to educate parents and community were very valuable. I would absolutely recommend this course to coaches. If we are to keep coaches progressing in the profession we need to have them engaged into coaching in all 3 dimensions.The 2nd & 3rd dimensional topics and the strategies were very useful. The amount and content of the information in this course was fantastic! The times have changed since my high school athlete days, and as a coach I have to change also. It was valuable learning how to think about things through the student-athlete's perspective. I would recommend this course. It gives an interesting perspective. It was valuable to be reminded of how much coaches influence their student athlete's lives. I would recommend this course to other coaches. Many of my previous coaches had a mindset of only winning. The application of everything that was discussed was extremely useful. I think regardless of what level you are coaching there is something from this certification that you can apply to your program. Athletes are different today because they have been raised differently and this course gives a game plan to coach today's athletes. I am always looking to improve as a coach and I feel I have definitely added some tools to the tool box. I would recommend this course to other coaches, it is very comprehensive. It was valuable to learn how to identify and treat scenarios depending on which dimension the issue is surfacing in. The most valuable thing I got out of this course was how to build relationships with students. I would recommend this course because too often coaches are just worried about winning. Building a culture is more important. I would recommend this course to other coaches simply to educate them about how important it is to be apart of your athletes lives on and off the field. Learning about the importance of using second and third dimension coaching was very valuable. Without 3D level coaching our young athletes are missing the opportunity for a life changing experience. I would recommend this course 100%! Not just for coaches of all levels, but also for parents. The course was excellent and well laid out. Coaches at any level would benefit from the course because the development of all 3 dimensions is a continuous process. I will recommend this to not only coaches but leaders in general. This course has brought tears to my eyes several times and it just brings out the best in you. Just the overall way it was explained and detailed was awesome. I think the most valuable piece of this course was my self reflection on the impact I want to make for my student athletes. I would definitely recommend this course to other coaches because I think it is a valuable tool to making you a better person and educator. This course allowed me to reflect on my own coaching strategies, to coach outside of the 1st dimension. It will make me a better coach, and in turn help my athletes be more successful. I would recommend it to other coaches because it gives great strategies to help coach the present day athlete. This course really shows the more importance of why you coach instead of how. The ways on how to build the relationships with the kids to bring a better commitment & enthusiasm into my programs. were the most valuable part. I felt that this course offered a deeper level of compassion that some of our coaches and coaching programs are missing. I would recommend this course to other coaches because it provides a purpose that we should all strive to complete as a coach. This course affirmed my coaching philosophy and mission statement. I would recommend this course other coaches. All coaches can get something out of the course. Many good ideas and concepts. The lessons on the 2nd Dimension of coaching were very valuable. I would recommend this course because there are plenty of coaches who need to move their coaching to the next level. This course is a tool we can use to resuscitate and reignite the very essence of coaching. It reminds us of the importance of coaching the Heart for transformation purposes, as opposed to the worldwide norm of transactional coaching. I recommend this course because you will learn the different levels of coaching. It was valuable to learn how to capture the hearts of our players. I recommend this course for coaches. Every coach can be better. Plain and simple. I feel I do a really good job, but this showed me ways to be better. I learned a lot about myself and about how I want my programs to look. I feel that this course is just going to make my program better and stronger. The most valuable thing I got out of taking this course was taking the time and reflecting on my own coaching, and what I will change as a result of this reflection. I feel if more coaches coached in the 2nd and 3rd dimensions we would see greater participation in sports at the high school level. I started to use the tools in this course as soon as I learned them and they have help my team already. Learning how to talk to my wrestlers about more than just the mat and school was the most valuable part of taking this course. I am definitely going to recommend it to my assistant coaches because I think it does a great job of emphasizing what the true purpose of sport should be. Too often we as coaches get caught up in the idea that it is all about wins and losses and we forget that it's all about kids. I recommend this course to other coaches. It is eye opening to the other aspects of coaching that are rarely discussed in typical coaching education. Learning about coaching more than the fundamentals and physical side of the sport was very valuable. Reaching athletes on higher levels to help them reach their potential. This course gave me hope that there is a better way to coach and there are strategies in place that can be utilized for coaches to pursue excellence through goodness. I would absolutely recommend this course. I am an Athletic Director - I heard Dr. Duke speak at the National AD's Conference in Florida - I now have a vision to move forward with a comprehensive professional development for all my coaches. I would ABSOLUTELY recommend this course! I think a lot of my methods, tactics, and reasons for coaching were validated. It is nice. This course digs considerably deeper in ways to reach our kids and somewhat forces the coach to get an idea of how, what, why, etc. we should be coaching 3-dimensionally. I was intrigued, and subsequently, am a better coach already, having seen a fraction of 3D Coaching over the Summer at Silver College for USA Wrestling at University of Wisconsin. Incidentally, I was exposed to intrinsic vs. extrinsic motivation. I have competed nearly my entire life and never really 'got' how my own sons were never overly excited to wander around in their medals after a long tourney. Looking at the whole picture, I see that they are wrestling...for intrinsic purposes. They enjoy the competition, trying their takedowns, 'the sport,' and the 'game.' Knowing the difference, I am able to motivate much better, but, again, am validated in my own, already built, system for wrestling: (1. )FOUNDATION: We will build a foundation, fundamentally-strong, that will easily translate to any program, (2.) SUCCESS: We will help define success based on our athletes' unique skills/needs and, then, help them find it. (3.) FUN: perhaps, most-important, we will teach, learn, and compete in a way that is fun for all involved. This course helped me to see that most coaches stay in level 1 and we need to work on reaching all 3 levels of our athletes. I would like to have all my coaches take the course. This course helped me to not be narrow minded within my teachings. I would recommend it to other coaches. It helps reduce the goal and success orientation of parents nowadays. I would recommend this course to other coaches because it was and can be a good reminder as to why we are coaching. It served as a valuable reminder that coaching is more than just about winning and losing.